Over a thousand optometric, retail and audiology Partners all in one place is an impressive sight. A standing ovation and applause from a thousand people is a spine-tingling moment. The 2016 Specsavers Partner’s Seminar in Birmingham saw the joint group CEO John Perkins, speak as part of his role guiding the overall success of the partnership and paid tribute to the staff members around the country who have gone above and beyond in serving customers. He went on to single out one individual who encapsulates the Specsavers spirit: Chorley’s Amelia Kendrick, the apprentice who was able to encourage a frightened 12-year-old autistic girl to have an eye test by decorating the test room. We do it for a young mum who walked into our Chorley store with her daughter. She wants the little girl to have an eye test, but it’s clear that the child is in distress. The mum, too, is close to tears. Her daughter has autism and visiting the opticians – an unknown and confusing environment – is terrifying. This is her seventh visit to an optician and she has yet to get past pre-test. Her mum is trying one last time before giving up. Her child’s torment is too much, and it outweighs the fear that her daughter might not be able to see clearly. This is when a special young woman named Amelia enters the child’s life. 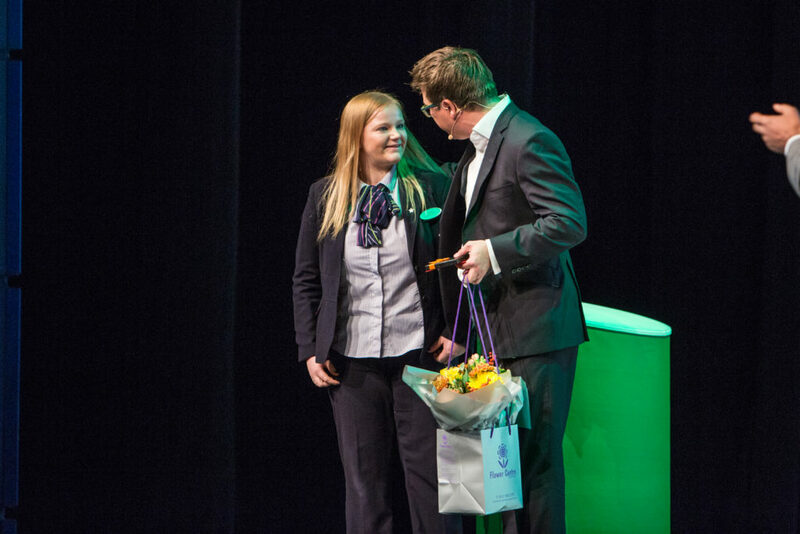 Now, Amelia hasn’t been at Specsavers for very long – in fact, she is one of our 500+ apprentices. And she might be young, she might be inexperienced, she might not have grasped all the intricacies of optics yet, but she sees a frightened child who needs help. Amelia kneels down to the child’s level, and speaks softly to her. She asks her what her favourite thing in the whole world is. The little girl says 'Frozen'. That’s it. That’s as far as they get that day. The child is paralysed with fear of the unknown, and although she likes Amelia, she panics at the thought of what might come next. Her mum thanks Amelia for her efforts, but is ready to give up, anxious to save her child from any more distress. Undeterred, Amelia books the child in for a pre-test on another day, and reserves a test room to make it calmer and more private. It’s plainly the little girl’s last chance to have an eye exam. The mother and child return and Amelia welcomes the girl into the test room. The girl’s eyes widen in wonder, as she sees that the room has been transformed into a princess’s palace from Frozen. Amelia – on an apprentice’s wage – has spent her own money to buy the decorations. She spent the evening before the appointment, without telling anyone, turning a plain-looking clinic into a grotto from a child’s dreams. The pre-test is no longer a threat. It is a magical adventure. Still, the mum fears that the full eye exam is a step too far. Amelia has thought of that. She has briefed the optometrist in advance, and the handover for the test takes on a Disney theme. The enchanted child sits through the test, chatting happily about Frozen. And, yes, she does need glasses. And yes, she holds Amelia’s hand through the frame selection. Now, when someone asks the little girl what her favourite thing in the whole world is, she doesn’t say Frozen. Frozen comes second to glasses. One Glasgow store has the official accolade of being the UK’s first autism-friendly optician’s but it isn’t Specsavers standard operating procedure to redecorate test rooms in the theme of a Disney film to help customers feel more relaxed. Changing a 12 year old’s life for the better isn’t in the training manual. Amelia and her team did this, like many other staff around the country – because of their passion to make a difference. “The why” of Specsavers is helping to change customers’ lives – the lighthouse that will guide us through the uncertain world we face. When he welcomed the shy apprentice on stage, a spontaneous standing ovation occurred and there was not a dry eye in the house.